Karthekeyan system of indian palmistry. Lord.karthikeya taught this divine lesson to sages of india. 153 lines on palm. Most ancient and accurate method of predictive palmistry is karthekeyan system of palmistry from india. 1. klesa rekha- it is termed as accident line by westerns. Presence of this line produces bundle of worries. Specially, if it encircles the jupiter mount more, the worries will be more. Feel free to share your opinions if you have klesa rekha. Re: Karthekeyan system of indian palmistry. Lord.karthikeya taught this divine lesson to sages of india. 153 lines on palm. I would like to introduce here a work presented by the Indian palmist V.A.K. Ayer, who translated an old Sanskrit manuscipt, titled: 'Sariraka Sastra'. Ayer's book counts 112 page and was published in 1965 (back then he described that the Sanskrit manuscript was almost 400 years olds - so now it can likely be described as older than 400 years, which implicates that likely the original Sanskrit maniscript was written somewhere in the 16th century). 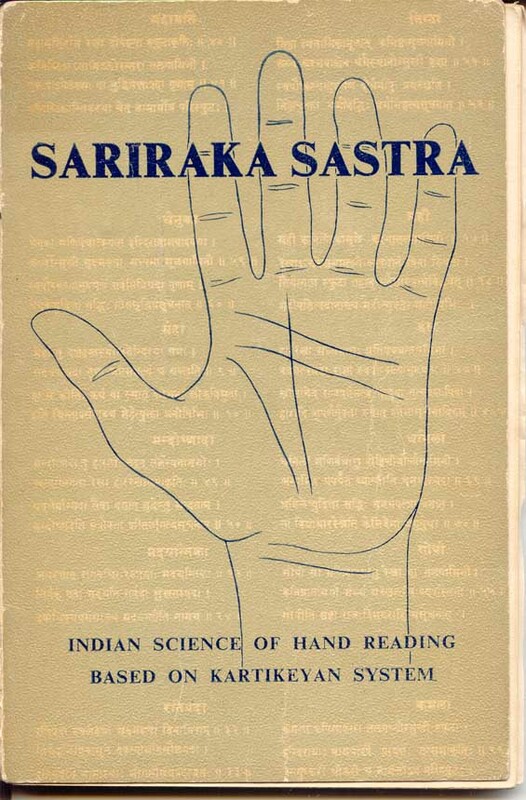 Basically, this work can be as recognized belonging to a less known hand reading approach, the so-called: 'Kartikeyan school' (this concerns a less well-known system of traditional Indian palmistry which became very popular in the South of India - but this system is far less known than the most famous Indian system which is also known as: 'Hasta Samudrika Shastra'). The unique characteristic of the 'Kartikeyan school' is that it describes a name for each of the 153 lines that can be found in the right or left hand (which 'Hasta Samudrika Shastra' only describes names for the major, minor & some accessory lines). Ayer's book deals e.g. with 78 line characteristics for the right hand, and 75 line characteristics for the left hand + some more materials (the original manuscript includes much more materials but Ayer decided not to present all those materials - for various reasons). "... In view of the unfortunate fact that most of the existing books claiming to describe the Indian system of Palmistry happen to be but variations of the western system, I thought fit to give the Sanskrit original also alongside for authentification. ..."
Below I present I photo-copy of the examplar of this book that I cherish for over quite a few years in my library. Link to buy this book.. Thanks for the link. . by the way when i entered the link last time, it showed 2 copies available. . . now one copy only available. . . patti bought the book some months back..
P.S: manfred, do you have copy of this book? yes I have. By the way: The correct writing is V.A.K. AYER. A book seller wrote it wrong. There is another little book of the same author, using the Western palmistry style: "Palmistry for pleasure and profit." ....this is the one I've got from India full with original Indian antique worm wholes! 1. Iyer / ayer .. Let what ever may be the spelling, the pronounciation should begin with the letter 'i ' .. Thanks manfred, I got this book from my friend 5 years back , then read and return it her back.. but it is sure that v.a.k.iyer has illustrated how fish, flower, kite and many other pictorial sign present in palm. Thats exactly a hindu's ideas of palmistry . Thats why i mentioned it. . . But i am always ready to accept the truth with either evidence or logic. . .
as I wrote before: Some Indian books are waiting for me and then I'll give a really qualified answer to your question. 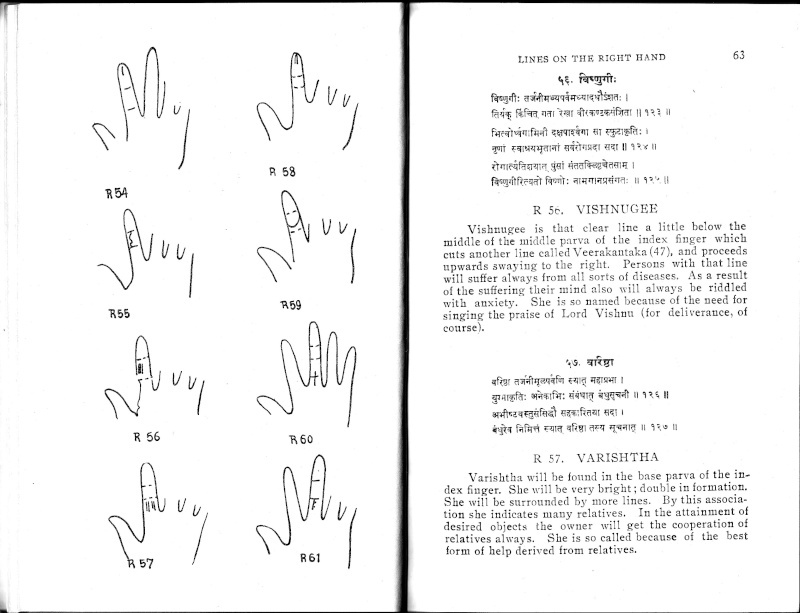 I know for sure that iyer's 'palmistry for pleasure and profits' is also containing notes on astro-palmistry and in the last chapter he illustrate the pencil drawn pictures of hitler, churcil, stalin(russian former president), vivekanandha, pernatsha, and still more celebrity hand pictures. From him i got the idea that star on sun mount indicates writing ability and author .. i have confirmed it true quite a few cases . 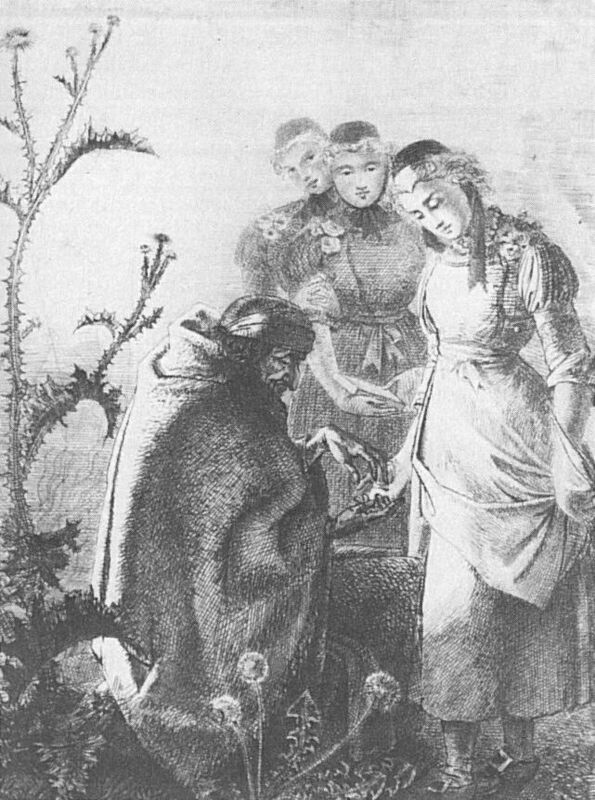 . .
as I just went though the 'palmistry for pleasure and profits' and also found some quotations of and at the end a list with Western authors I came to the conclution, that Ayer used Indian and Western palmistry. This doesn't mind anything for me, because for me it counts always the pur content. By reading fast I still find some content interesting - that of the Mounts, example: The Mount of Saturn = Mother. A deep line there success by own effort and a near colesness to the mother..and more. I can't say too a lot about his astropalmisty because I use Western astrology. It would be a long discussion specially about the placing of the Zodiac signs I can't manage. Here and at other places I have very doubts. All in all still worth to read for picking some pearls out.. They are not too much pages. Thanks manfred, I cannot make any reference now as i dont have that book for past few years. . . 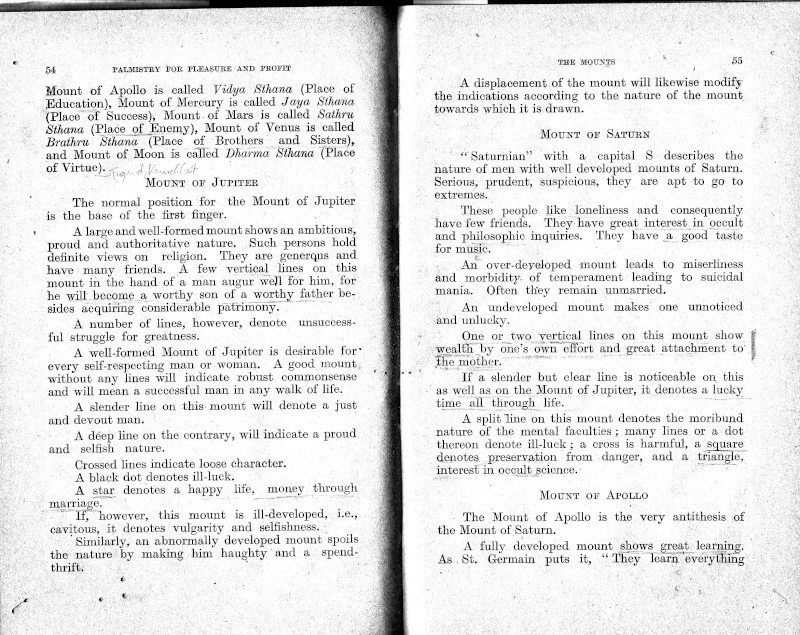 However, it is true that in the karthekeyan system of palmistry explained by iyer in his book does not name the mount by planets. rather he name it as the mount of father, mother, enemy, education, virtues, etc., In this also he relates the saturn mount with mother and jupiter mount with father. . . But he does not explain further anything about it in this book. so i find difficulty in associating the same. However, thanks for your insights..
ps: Very antique with original worm holes. Thanks for your efforts. . . However, make it clear that what you have posted is a page from the iyer's book titled 'palmistry for pleasure and profits'. Otherwise, peoples can misunderstand either. . . Unfortunately, i could not read it due to poor quality or as i am browsing through my mobile phone. . When i read this book some years before, i was knowing nothing about astrology . . . so i was not giving importance to those aspects. now i ready to learn and know things from this. . . I also make you remember here that kamalama muni's system of indian palmistry name the forked end of life line as mother and father line respectively. However, I believe that all this perspectives remain true. . . Among this all, some system exclusively look for palmistry aspects. where as other indian system like Vedic system try to associate the astrology and palmistry together. . . This is being the one of the major differences among various schools of indian palmistry.That's why it is very much essential to note that which system we follow. . . The important aspect that we need to be careful with, is that we suppose to know and able to distinguish what system we follow and the related principle of it. Unfortunately, palmists are ready to gather collective knowledge without knowing its source and principle. This is being the setbacks of palmistry nowadays. Love the artwork! Just added it to my collection! Thank you! Spelling Ayer with an "I" won't be helpful to those trying to find the book by the author's last name. In some languages when there is more than one vowel grouped together, some are silent. Ayer may relate to the word/title 'heir'.